Wedding customs have changed over the years. One of the most charming to have become less important is the matter of the bride's trouseau. 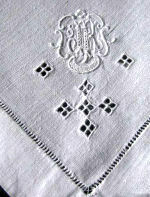 When the daughter of the family married, she was expected to bring a dowry of lovely linens. Over the years prior to maturity she would have accumulated everything from wedding hankie to Christening cap; kitchen towels to banquet table linens. Most would have been handmade by the females of the family. The trouseau became a showplace of lacemaking and embroidery skills. 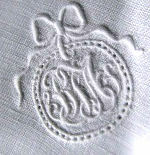 Elaborate monograms abounded, the triple monogram being considered the most prestigious. The problem, of course, was that handmade linens were accumulated over the girl's lifetime, most of them before the husband was chosen. The most practical solution was to monogram with the bride's maiden initials; her first and second initials were placed to either side of her maiden-name initial.  More frequently the item was completed with space left for the addition of the married surname initial; her first and second initial to either side of his surname initial or her first and maiden-name initials to either side of his surname initial. If the husband had been already chosen, his first and her first initials appeared to either side of his surname initial. 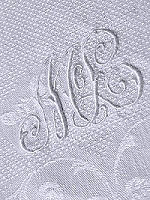 Monogrammed linens were carefully preserved and handed down from mother to daughter or daughter-in-law, sometimes from grandmothers or aunts. As you can imagine, various monogram combinations would be proudly displayed in a single household. 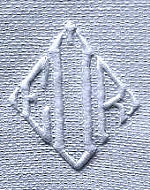 Even if the monogram bore no resemblance to the current owner's initials, the appearance of an elaborate monogram signified family. The age of dowries has passed, but the elegance and charm of the monogram remain. Although it is fun to find a monogram with at least one of your initials, you will probably choose the item more for its style and workmanship.